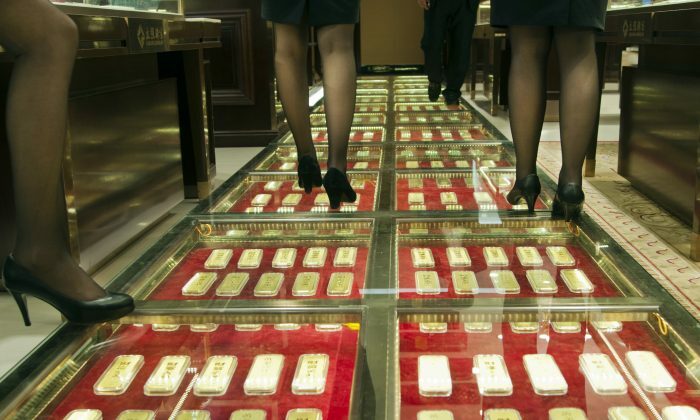 China, it seems, wants to make the rules in the international monetary system, which is why it has been acquiring vast amounts of gold through both private and official channels. 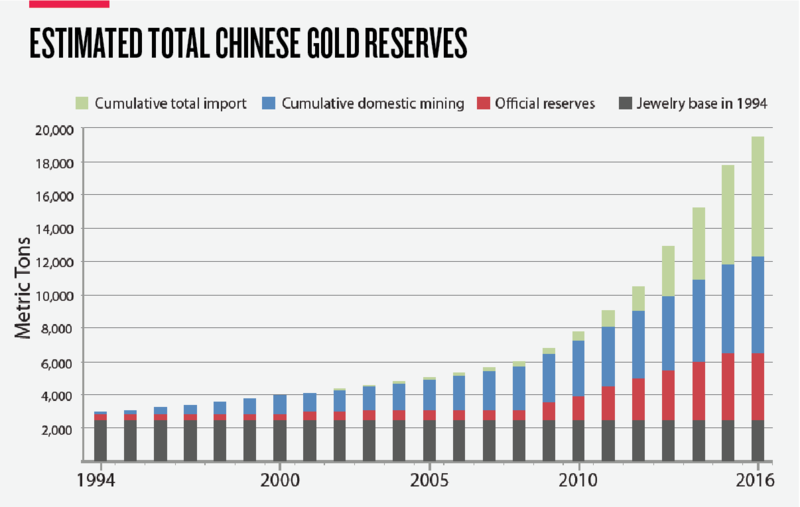 Because of the obscure nature of the Chinese gold market and the reluctance of Chinese officials to show their hand, nobody has been able to accurately calculate how much gold the Chinese have acquired since 2000, when they began amassing it. Enter Koos Jansen, an analyst with Singapore bullion dealer BullionStar. He has studied the Chinese gold market for years and recently came up with an estimate of total Chinese gold holdings: 19,500 metric tons, or 21,495 U.S. tons, at the end of January 2017. “They have promoted gold ownership as a store of value since at least 2002, but more so when they introduced the ‘storing gold with the people’ concept [a campaign encouraging private citizens to buy gold] in 2004,” said Jansen. But where did China get all this gold, when in the year 2000 it only had about 4,000 tons in total? “In the 1970s, when China needed foreign exchange, that’s when they started their mining industry. They were supposed to start exploration, and the people were incentivized to mine gold. That’s why there are so many gold mines in China.” He pegs the number at around 600. Those 600 mines produced 490 tons of gold in 2015, making China the biggest producer, ahead of Australia, which produced 300 tons. The next piece of the puzzle is imports from other countries. According to Jansen’s estimates, China imported about 1,300 tons of gold in 2016, mostly through Hong Kong but also directly from Switzerland and the United Kingdom. Private demand comes from individuals who want to diversify their assets, institutional investors like pension funds, and jewelry companies for later resale, among others. “Companies and individuals buy gold for the same reason: Get out of the renminbi, diversify, protection, etc.,” he said. As for the central bank, Jansen says that their purchases don’t show up in official import statistics and are kept as a close secret. “The Chinese army even has a special division, I call it the gold army. It was also launched in the 1970s for exploration, at first. This gold army can still be active. They can pick it up directly in the U.K.,” he said. The central bank also uses commercial banks who buy in Switzerland or South Africa and secretly ship the gold to China. For example, the total gold holdings of the London Bullion Market Association dropped by 2,750 tons from 2011 to 2015, but net exports were only 1,000 tons. Thus, 1,750 tons are unaccounted for and most likely ended up in official Chinese reserves. According to Jansen’s contacts at Chinese banks, official holdings are closer to 4,000 tons rather than the published figure of 1,842 tons. What does China need that gold for? “They buy official gold to internationalize the renminbi. If there are enough gold reserves backing it, they can make it a credible world reserve currency.” Whoever has the gold makes the rules.